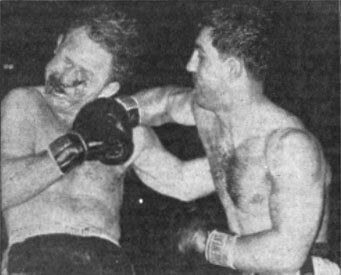 Rocky Marciano upped his record to 39-0 and moved one step closer to a world title shot, by scoring a 7th round TKO over the veteran Lee Savold, on this day in 1952. The bout was held at Philadelphia's Convention Hall before 9,243 fans who came to see the newest young heavyweight lion. It was a messy affair, with Savold's blood reportedly splattering the ringside audience. Although some reports criticized Rocky for looking crude and being unable to score a clean knockout, win the bout he did, as Lee's corner stopped it before the 7th. The Rock would go on to his title shot seven months later.